“Myriam, I want to show you something,” said Kitty. “My friend from Turkey has returned today and he was so kind to bring me a small present. He said to me it is an Islamic amulet and it would protect me from envy look. Kitty had a huge amulet in her hands. It was a round thing about ten centimeters in diameter reminding a huge blue eye. Myriam showed no emotions about Kitties present, she was a bit confused. She was sitting looking at Kitty silently. “And my Turkish friend claims it is Islamic,” insisted Kitty. She took her present and left the room with the air of offence. Myriam was angry with Kitty as well, but this case encouraged her to learn some facts about Turkish blue eye. It had a long history in fact. This symbol was found in almost every culture including Ancient Egypt. It was believed that, this eye saw all the wickedness in the world and removed poverty and ignorance. Those beliefs seemed still relevant as the figurine of eye could be found in many regions like Middle East, East and West Africa, Central America, South Asia, Central Asia, and Europe. She didn’t pay much attention before to superstitions, but after Kitty showed her admiration to this amulet she started noticing it everywhere. The next day she went to a small shop near mosque where one could find some Islamic stuff. When she looked at the showcase she was stunned seeing the Turkish blue eye everywhere. The head swam of the view of amulets, bracelets, rings, earrings, pens, trinkets. “This Satan eye is everywhere,” she thought as she was exploring the showcases with big surprised eyes. “May I help you?” a young Muslim lady interrupted her from her thoughts. “Yes… Could you tell me what it is?” asked Myriam pointing at one of the amulets. “This is Turkish eye. They wear it for protection from ill-wishing look and also they fix it on the walls of the houses,” the girl explained smiling. Imam looked at her with the air of indignation. “You are a smart young lady, Myriam, and you are here with such a stupid question,” he said to her. Myriam understood that she had been right before and blushed being angry with herself that she allowed her heart to doubt. “Shirk is the most horrible sin as Allah Subhana wa Taala doesn’t forgive those who commit shirk. Searching for help and protection from other things besides Allah is shirk. “Yes, it is clear as a day that it is shirk when a person hopes that an artificial eye protects him. But why is it so famous among Muslims? When I came to the small shop near mosque today I saw this amulet everywhere,” – Myriam told sadly. “Amulets, like Turkish blue eye which you are talking about are very widespread because of people’s poor knowledge of Islam, especially Muslim’s poor knowledge as this thing is famous in particular in Muslim countries. 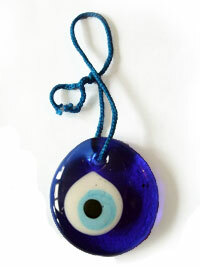 Many Muslims believe that this Turkish evil eye is from Islam actually. This is misguiding thinking. Prophet Mohammad warned us from wearing any talismans. Myriam thanked imam and went home. On her way she was thinking about the role of superstitions in human life. People truly believe that a black cat crossing the road brings bad luck, that if you put a bag on the floor you will have less money, that if you sprinkle salt you will have quarrel; unfortunately life is full of superstitions, they sit so deeply in the heads of people that often they combine knowledge of God with misguiding knowledge of Satan. This is the reason of beliefs that a figurine of a blue eye protects from ill-wishing look. Yes, there is magic, there are spirits, there are many phenomena which we cannot see or understand. No one can deny it. And the Prophet Mohammad (peace be upon him) said "The influence of an evil eye is a fact..." But it is not a blue eye amulet which protects from it. It is praying, reading Quran, searching protection of Allah. Satan likes amulets and superstitions as one who follows this way worships him. Such person forgets gradually knowledge of Allah and falls into sin gradually. But there is a thing which Satan cannot stand: he is afraid of a sincere person who believes in Allah with all his heart, who is afraid of Allah, who shapes his soul in praying and who is searching protection only from Allah. Satan can do no harm to such person. What prevents us to be like this? Myriam signed sadly and went to her room to pray.